Preparations for the 8th BRICS summit in Goa have begun. India is preparing a list of priority projects to seek investments from BRICS countries during the 8th summit of the heads of state of the group of the world’s major emerging economies, scheduled to be held on October 15-16, in Goa. For the next BRICS summit, scheduled to be held during India’s presidency in Goa on October 15 and 16, India is readying a list of priority projects to invite investments from BRICS countries. The prospective projects for investments, mainly in the field of infrastructure, are expected to give a thrust to Indian Prime Minister Narendra Modi’s “Make in India” programme. The initiative, is expected to raise the level of trade and economic cooperation among BRICS (Brazil, Russia, India, China and South Africa). “Over 50 meetings and events at various levels would be held through the year. 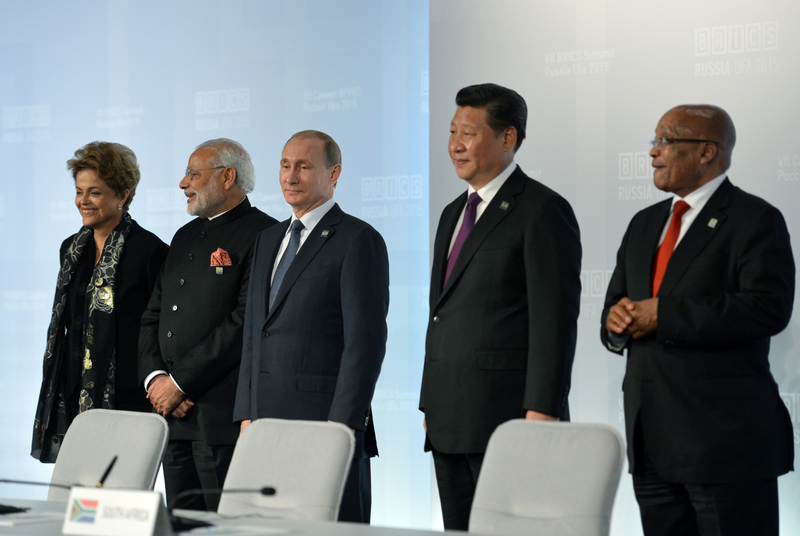 'Building Responsive, Inclusive and Collective Solutions’ is the core-theme for our BRICS chairmanship. Enhancing greater people to people participation in BRICS events will also be our priority. It will also be our effort to organize various BRICS events across the country in different States,” External Affairs Minister Sushma Swaraj said on March 22 in Delhi, at a function to launch the BRICS Logo and summit website. Swaraj congratulated Sudeep Gandhi, who designed and won the BRICS Logo 2016 contest. Painted in BRICS country’s colours and symbolizing India’s national flower, the BRICS Lotus encompasses the BRICS spirit and will grace all related events through the year. According to officials, India’s list of projects is likely to be similar to the one Russia prepared last year during its chairmanship of BRICS, which included around 60 projects. Swaraj said in her address that in the run up to the Goa summit, India would hold a number of meetings at different levels of various sectors, to prepare for the 8th BRICS summit. “We will adopt a five- pronged approach during our chairmanship. It will comprise Institution Building, Implementation, Integration, Innovation, and Continuity with Consolidation,” Swaraj said. India is chairing the rotating summit for the second time after it hosted the 4th BRICS summit in March 2012, in New Delhi. The previous BRICS summit was held in July 2015, in Ufa, under Russian President Vladimir Putin’s chairmanship. The Ufa declaration adopted the strategy for economic partnership and, as a follow up, India is working on a programme to develop trade, investment and economic cooperation in a number of fields, including manufacturing, minerals processing, energy and agriculture. The Indian Prime Minister had, at Ufa, proposed a 10-point programme for consensus between member-countries, to hasten the process of closer cooperation between BRICS nations, in the present global economic slowdown. The programme takes into account the immediate issues confronting the BRICS member-countries. The main objective of the theme of India’s chairmanship, ‘Building Responsive, Inclusive and Collective Solutions’ (BRICS), is to ensure BRICS work closely to find solutions to issues confronting the group’s economies. H.H.S. Viswanathan, former diplomat and BRICS specialist at the Observer Research Foundation, said India wants to build on initiatives started by Russia and chart new pathways for growth. “Developing continuity is crucial for BRICS,” Viswanathan said. India’s Ambassador to Moscow, Pankaj Saran, recently said preparations for the 8th BRICS summit have begun and India would consult with Russia to ensure that the momentum and scope of the group’s activities were maintained. “We highly value Russia’s role as BRICS chairman in 2015,” Saran said. “The point of view from which we will approach the task as the BRICS chairman is based on the benefit the organization will be able to bring to the global economy,” he said. At the Ufa summit, both Putin and Modi expressed their commitment to the progressive development of cooperation within BRICS and strengthening its role in the global economy. During 2016, India plans to launch greater cooperation among BRICS in services and in ways to deal with non-tariff measures restricting goods trade between BRICS member-countries. Official sources said the BRICS Contact Group on Economic and Trade Issues (CGETI) will meet in April to discuss trade and economic issues, including India’s list of priority projects, and a proposal to establish a mechanism to expeditiously resolve non-tariff barriers. In services, the meeting will exchange opinions to intensify cooperation in different mutually beneficial fields including education, travel, tourism and health. The CGETI will prepare the agenda for BRICS Trade and Economy Ministers. The final action plan document will be finalized at the last meeting, to be held with the 8th summit. As BRICS chair in 2016, India is pursuing a pro-active economic policy, aimed at enhancing mutual cooperation among member-countries. It plans to push for an agreement on business visa liberalization and issuing business travel cards during the summit. Visa liberalization is expected to allow businessmen multiple-entry business visa for a longer period of time. Media reports suggest that India is also working on a programme for cooperation in the field of micro, small, and medium enterprises (MSME). Modi, who is taking a special interest in making the summit a success, with an “Indian imprint,” has instructed concerned officials to work on his 10-point programme, to boost cooperation between the BRICS nations. A BRICS Film Festival, BRICS Under-17 Football Tournament, BRICS Friendship Cities Conclave and a BRICS Youth Summit will also be held to further people-to-people contacts among member-countries. Some of these events may coincide with the summit in Goa.